Horace Copeland is well known for his success as a top-notch wide receiver for the Hurricanes' football team. Copeland's 47 receptions for 769 yards in 1992 still places him among the school's top 10 single season performances for receiving yards. Additionally, Copeland's NCAA-record tying 99-yard touchdown reception from eventual Heisman Trophy winner Gino Torretta in a 31-3 season opening win over Arkansas in 1991 ranks No. 1 all-time at Miami. However, Copeland was just as accomplished, if not more so, for his accomplishments in the men's track program. 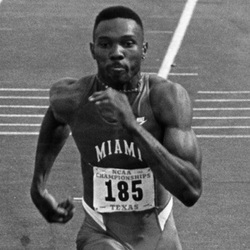 He became Miami's first track All-American with a fifth-place finish in the long jump at the 1992 NCAA Outdoor Track and Field Championships in Austin, TX. Earlier that season, Copeland was named the Most Outstanding Performer at the 1992 BIG EAST Outdoor Track and Field Championships after winning the 100-meters and long jump, and anchoring the 4x100-meter relay to victory. Copeland's winning long jump of 25-10 established a new UM and BIG EAST record, both of which still stand in 2002. Copeland also holds the UM indoor school records in the long jump (25-04.75) and high jump (6-09.50). A two-sport athlete, Copeland was a three-year letterman as a wide receiver on the football team, was a member of the 1991 NCAA Championship football team and started every game in 1991 and 1992. Copeland ended his UM football career with 84 receptions for 1,424 yards. He went on to get drafted by the Tampa Bay Buccaneers in the fourth round, where he played from 1995-98. Copeland also played for the Miami Dolphins and Oakland Raiders before his retirement from professional football in 1999.